OMD had a strong performance all over the world. Its most-awarded units include OMD Singapore, for "happier mornings with McDonald’s", and OMD UK, for McDonald’s "FryFutbol", Pepsi Max "unbelievable" and Sony PlayStation "for the players". PHD joins the top three for the first time, up from fifth place last year, helped by four gold Media Lions in Cannes. The London agency landed awards for "The Lego Movie ad break", Sainsbury’s "Boredom Busters" and Harvey Nichols "sorry, I spent it on myself". 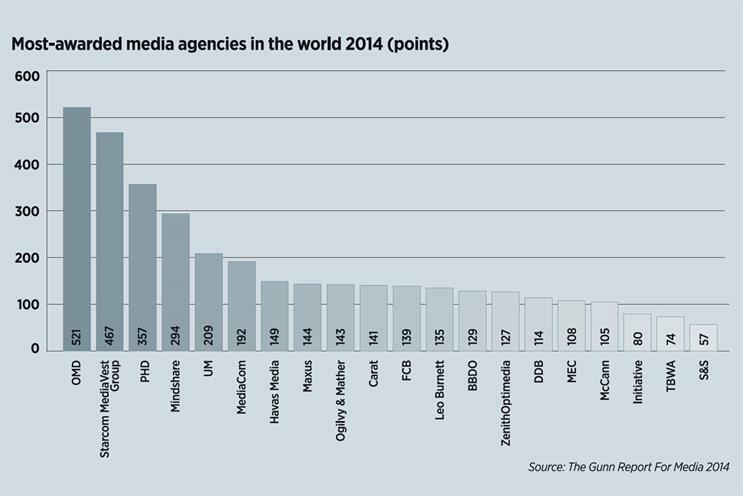 The 2014 report also highlights that media agencies are entering – and winning – more awards than ever before, including in the non-traditional realms of PR, promotion, direct, effectiveness, cyber and branded content.